Some 50 participants from Antigua, St. Maarten, St. Thomas, St. John and St. “Croix competed against the hosts in the annual BVI Dinghy Championships that wrapped up two days of exciting competitive racing on Sunday. BVI Dinghy Championships coordinator Shakti Sedura said she was happy with the overall event. She said they wanted to create an atmosphere where people were comfortable and attract more of the younger crowd who want to sail but doesn’t know how to get involved. The event also included the final leg of the Virgin Islands Sailing Triple Crown—which began in St. Croix’s Cruzan Open followed by the VIODA Championship Regatta in St Thomas the weekend Dinghy Championships. By time the last boat has crossed the line, St. Thomas’ Teddy Nocolosi—who also was the over all winner in the Optimist Red Fleet—had led his team to the VI Optimist Cup. St. Thomas’ Coach Agustin “Argy” Resano said the VI Optimist Cup was good competition but the BVI did not participate in the St. Croix leg and didn’t have a chance to score. The event he said shows consistency. Award winners: White Fleet—10 and Under. 1. Mia Nicolosi, St Thomas. 2. Nathan Haycraft, BVI. 3. Maria Eldridge, St. John. Blue Fleet—11-12: 1. Rayne Duff, BVI, second overall, BVI. 2. Mateo DiBlasi, St. John. 3. Thad Lettsome, BVI.Red Fleet—13-15: 1. Teddy Nicolosi, St. Thomas, 1st overall. 2. Rocco Falcone, Antigua, 3rd . 3. Robert Hunter, St. Thomas. Laser Full: Andrew Barlas, St Thomas. Laser 4.7, Abby Maddox, BVI. Laser Radial. 1. Rhone Findlay, St. Martin. 2. Chris Muphy, St John. 3. Jason Putley, BVI. Byte: 1. Scott McKenzie, St. Thomas. 2. Paige Clark, St John. 420- Sara Hardee, St. Croix. Sunfish –Benjamin Barlas. IC-24. 1. Colin Rathbun, Fiona. 2. Andrew Waters, Foxy Lady. 3. Chris Haycraft, Latitude 19. 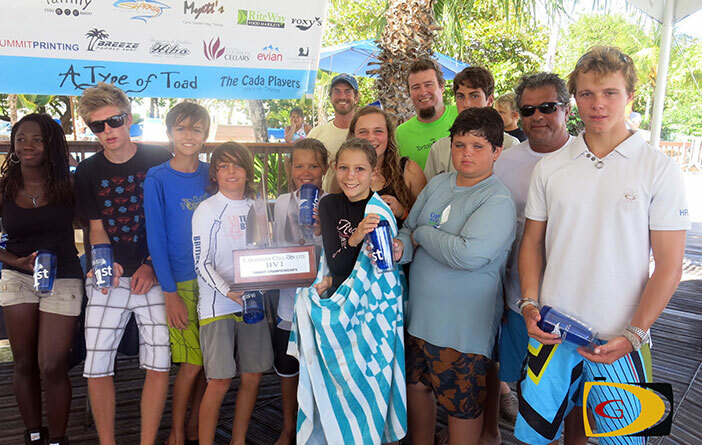 Optimist VI Cup: Top Girl in this event and 5th overall, Mia Nicolosi, St. Thomas. 1. Teddy Nicolosi, St Thomas. 2. Mateo DiBlasi, St John. 3. Chris Sharpless, St Thomas.